From start to finish, spin any type of fiber into yarn that is ready to use for your favorite knitting, crocheting, or weaving projects! 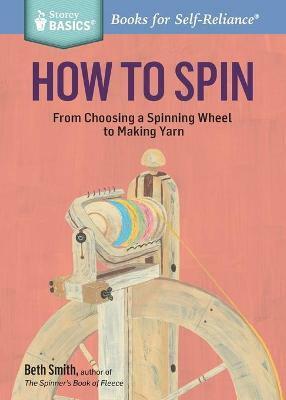 With expert author and teacher Beth Smith's step-by-step instructions and encouraging guidance, plus detailed illustrations and an extensive glossary, this indispensable resource covers everything rom choosing your wheel to drafting the fiber and plying and finishing your beautiful yarn. Beth Smith, author of How to Spin and The Spinner's Book of Fleece, is renowned for her love of the variety and versatility of sheep breeds, and she teaches the whys and how-tos of preparing and spinning wool from different breeds. For seven years she owned The Spinning Loft, a shop celebrated for its selection of hard-to-find quality fleeces. She teaches internationally and writes for PLY, Spin Off, and Knittyspin magazines. She also sits on the editorial board of PLY magazine. She lives in Howell, Michigan.